Percival Drayton was the son of South Carolina Congressman William Drayton. 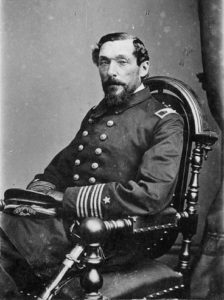 He entered the US Navy as a midshipman in 1827, and served continuously up to the Civil War, being posted to stations that included the Mediterranean, the Pacific off the coast of Brazil, Paraguay, and at the Naval Observatory, Washington, DC. His older brother, Thomas Fenwick Drayton, was a West Point graduate and a US Army officer who remained loyal to the South and became a Confederate brigadier general. When the Civil War began Percival was stationed at the Philadelphia Naval Yard, but was soon given command of the warship USS Pocahontas. He commanded the vessel in the successful Union Naval assault on Port Royal, South Carolina in November 1861. In that action, he fired upon troops and positions commanded by his brother Thomas who was commanding Confederate troops on shore in a literal, classic instance of the “brother against brother” phrase often used to describe the American Civil War. He was promoted to Captain, US Navy in July 1862, and was assigned to Admiral David Farragut’s West Gulf Squadron, and commanded Farragut’s flagship USS Hartford in the celebrated Naval assault and capture of Mobile Bay, Alabama, in August 1864. Percival died August 4, 1865, and was buried in St. John’s Church in Washington, DC, however his remains were exhumed three months later and he was re-buried at Laurel Hill Cemetery next to his father, William Drayton. Jack P. Lieberman, a native of Cheltenham Township, PA, obtained a B.S. in Economics in 1965 from Villanova University. 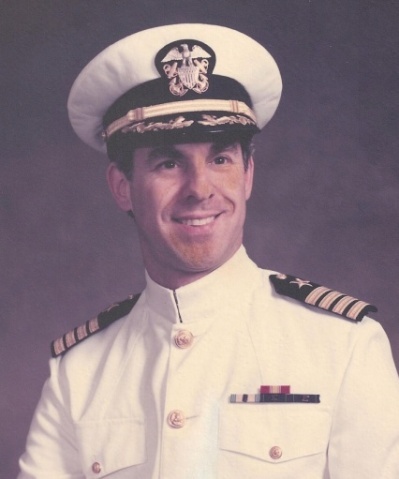 Following graduation, he was commissioned an Ensign in the U.S. Navy and served as Gunnery Officer/Nuclear Weapons Officer aboard USS San Marcos (LSD-25). Subsequently, he served in Aviation and Surface Units and on the Readiness Commander (REDCOM FOUR) Inspector General’s Staff. Upon attaining the rank of Captain, he was appointed Commanding Officer of several Military Sealift Command units and Chief of Staff Officer during Exercise Rainbow Reef at Diego Garcia in the Indian Ocean, a convoy training exercise, preceding Operation Desert Shield/Desert Storm in 1991. Jack retired from the Naval Reserve, after having served twenty-eight years. His military decorations include National Defense Service Medal with Gold Star, Armed Forces Reserve Medal with Hour Glass Device, Expert Rifle Medal and Expert Pistol Medals, Navy and Marine Corps Overseas Service Ribbon and the Navy Recruiting Service Ribbon. Jack is a Life Member of the Naval Reserve Association, Reserve Officers Association, U.S. Navy League, Military Order of the World Wars (MOWW), U.S Naval Institute, Military Officers Association of America (MOAA), Naval War College Foundation and the American Legion. His community, professional activities and organizations include U.S Navy Memorial Foundation, Jewish War Veterans, Sons of Union Veterans, Chestnut Hill Historical Society, Springfield Township Historical Society, General Meade Society, Delaware Valley Civil War Round Table, Confederation of Union Generals and Congregation Keneseth Israel, and the Union League of Philadelphia. He is married to the former Carol Cooper of Wyndmoor, PA. They have one son, David, who is a graduate student at West Chester University. This entry was posted in Meeting archive on July 30, 2016 by hlj.